Toll-like receptor 4 is a member of the cell surface pattern recognition receptors involved in pathogenesis of several infectious and autoimmune diseases. The wide range of Toll-like receptor 4 extrinsic and intrinsic ligands means that it has considerable ability to trigger infectious and sterile inflammation, the latter assumed to be the principal cause of ischemia-reperfusion injury. With the rising number of renal transplant procedures using deceased donors, in addition to prolonged ischemia time due to organ transport and consequently increased risk of ischemia-induced injuries, the prevention of detrimental immune responses and/or overcoming these after they initiate could be beneficial for graft survival. This review aims to summarize past and present studies conducted about the role of Toll-like receptor 4 in early and late phases of transplant, including gene expression and polymorphism evaluations. Toll-like receptor 4 belongs to the leucine-rich receptor family, which consists of a wide variety of receptors involved in pattern recognition, signal transduction, and cell-cycle regulation. The extra- and intracellular components of TLR4 are composed of 608 and 187 residues, respectively. The intracellular portion is called the Toll-interleukin 1 receptor (TIR) domain. The extracellular domain has 24 leucine-rich receptor modules, each one containing variable residues (20-33 amino acids); these modules are arranged in a special form such that the LxxLxLxxN motifs shape a concave surface by generating B sheets and the hydrophilic motifs induce a convex surface that contains several 310 helices, creating a horseshoe shape for this molecule. There are 3 subdomains in the TLR4 molecule: the N-terminal, the C-terminal, and the central area with different hydrophobicities and curvatures that twist the 2 ends of the horseshoe structure inward and outward.3 Toll-like receptor 4 is often displayed when binding to its coreceptor, myeloid differentiation protein 2, on convex surfaces of the central subdomain. The TLR4-myeloid differentiation protein 2 combination appears in a dimeric form on the cell surface4 (Figure 1). The best known ligand of TLR4 is the bacterial antigen lipopolysaccharide (LPS); others recognized by TLR4 include the pathogen-associated molecular pattern teichuronic acid, mannuronic acid polymers, mannan, F protein of respiratory syncytial virus, flavolipin from Flavobacterium meningosepticum, and plant paclitaxel. Moreover, some endogenous molecules can bind to TLR4 and elicit immunologic responses. These molecules have been categorized into 2 groups of extracellular and intracellular ligands.5 Extracellular ligands include hyaluronan, fibronectin, heparan sulfate, biglycan, and tenascin C.6 These molecules usually must undergo deformation or degradation to bind to TLR4. For example, huge glycosaminoglycan hyaluronan matrix molecules, after breaking into small fragments due to tissue damage, can stimulate tissue antigen-presenting cells. The TLR4 intracellular ligands include heat shock proteins (HSPs),7 high-mobility group box 1 protein (HMGB1), surface protein A, beta-defensin-2, calcineurin B, S100 proteins, resistin, fibrinogen, and amyloid B.8 These ligands are either released because of cell damage or secreted due to unusual stimulation. All of these above-mentioned ligands have stimulatory effects on TLR4; nonetheless, there have been 2 molecules described as TLR4 antagonists: LPSs of Rhodobacter species11 and LPS-like (CyP) molecules of Oscillatoria species. These render unresponsiveness or attenuate reactions after binding to TLR4; therefore, there have been some attempts to apply such molecules in ameliorating exaggerated responses to microbial antigens12 (Table 1). In the MyD88-independent pathway, the TIR-domain-containing adapter-inducing interferon-β related adaptor molecule binds to TIR and activates the TRIF molecule. The TRIF molecule as an adaptor protein phosphorylates TNF receptor-associated factor 3 (not shown) and receptor-interacting protein 1, leading to activation of TANK binding kinase 1 and mitogen-activated protein kinase (MAPK), respectively. In consequence, MAPK activates the AP-1 molecule, whereas TANK binding kinase 1 recruits interferon regulatory factor 3 (IRF3) together with other members of this family, including IRF7. As a result, transcription factors AP-1, IRF3, and IRF7 enter the nucleus and trigger type I interferon and production of other proinflammatory cytokines14 (Figure 2). 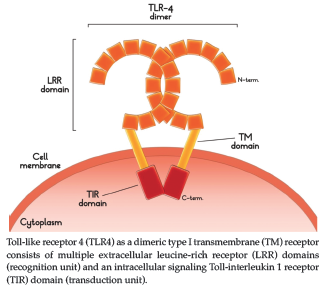 The main TLR4-expressing cells are antigen-presenting cells like monocytes, Langerhans, dendritic, and B cells; TLR4 is also expressed constitutionally in certain somatic cells such as endothelium, thyroidal mesangium, and endometrium, as well as in myocytes and adipocytes.15 The expression of TLR4 has also been detected in epithelial cells of proximal tubules and Bowman capsules in the kidney.16 The rationale of TLR4’s presence on nonimmune cells has not yet been fully understood, but it is hypothesized that this molecule is involved in developing initial responses to stress conditions in tissue. Ischemia due to transplant procedures occurs as a result of organ preservation (cold ischemia) and/or surgery processes (warm ischemia). During the ischemic period, some delicate components of tissues are disrupted; therefore, some rarely or nonexposed molecules are generated, spread, and become available to damage-associated molecular pattern (DAMP) receptors such as TLR4.17 The most known molecules in this context as mentioned before are HMGB1, heat shock proteins, hyaluronan, fibronectin, and heparin sulfate.18 Toll-like receptor 4 is constitutionally expressed on proximal tubules of nephrons; however, after reperfusion, it is upregulated in other parts of renal tissue such as distal tubules, glomeruli, vascular endothelium,19 and podocytes20; therefore, during ischemia-induced stress, both TLR4 expression and endogenous ligand release are increased, resulting in proinflammatory responses. The activation of TLR4 leads to 2 events. First is adhesion molecule upregulation. Subsequent to signaling, ICAM-1, VCAM-1, and E-selectin molecule expression is enhanced in vascular endothelium, facilitating leukocyte recruitment and trafficking in allograft tissue. This process is followed by the second event, which is secretion of interleukin (IL)-6, IL-1, TNF-α, MIP-2, and MCP-1 cytokines.21 Afterward, graft damage occurs due to immune cell invasion and activation. Reactive oxygen species and proteolytic enzymes are produced by macrophages and neutrophils, which exacerbate the tissue damage process and result in more DAMP release. These cells recruit lymphocytes to the allograft; however, considering that the invited lymphocytes have originated from the recipient, their encounter with alloantigens and minor antigens like agrin and angiotensin II receptor,22 which were hidden before, may cause sustained inflammation and more injuries. Regarding the implication of TLR4 in ischemia-related injuries, there have been some efforts to reduce ischemia-reperfusion injury by preventing TLR4 activation through administration of high-dose dexamethasone32 or recombinant HMGB133 before transplant in mouse models. Treatment with dexamethasone reduced IκB-α phosphorylation and nuclear factor κB expression; moreover, precon­ditioning with recombinant HMGB1 induced Siglec-G molecule expression, which regulates HMGB1-mediated TLR4 activation.32,33 Together, most collected data have suggested considerable involvement of TLR4 in ischemia-reperfusion injury and the association between its overexpression and more ischemia-reperfusion injury. On the other hand, knockout animals have shown better outcomes and tissue survival after the ischemic period. After initial inflammation due to ischemia-reperfusion injury, a sustained inflammatory process could be induced in the allograft. The tissue damage-immune activation cycle due to allo-/autoantigens appears to be continually released subclinically even after immunosuppressive drug administration. This immune activation can be amplified if additional stimulatory factors like infections are included. A wide range of microbial antigens could be recognized by TLR4 and induce immune responses; viral infections such as Cytomegalovirus (CMV) play considerable roles here. The role of TLR4 in acute rejection has been investigated in various solid-organ transplant models. In their investigation of a mouse intestinal transplant model, Krams and associates showed upregulated expression of TLR4 and TLR2 in allograft tissue; they also reported prolonged survival in TLR4-/- recipients in fully mismatched models together with less inflammatory cytokines in the circulation.34 Moreover, Goldberg and associates attributed the protective role of carbon monoxide against acute rejection in a mouse islet cell transplant model at least in part to TLR4 inhibition.35 Testro and associates showed increased baseline and stimulation-induced expression of the TLR4 gene, as well as elevated TLR4-dependent production of IL-6 and TNF-α cytokines in peripheral blood monocytes of liver transplant patients with acute rejection.36 In their microarray study using nephrectomy allograft tissues from patients with acute and chronic renal transplant rejection, Nogueira and associates showed TLR2 and TLR4 gene expression in tubular epithelial cells but did not find any enhanced gene expression in rejected tissues.37 We have also investigated TLR4 and TLR2 gene expression in biopsy samples from kidney transplant recipients during acute rejection episodes; however, despite MyD88 gene upregulation, neither TLR2 nor TLR4 genes were overexpressed (unpublished observations from Assadiasl and associates). In nonfunctional TLR4, deleted TLR4, and wild-type skin transplant mice, Samstein and colleagues could not find any significant differences in graft survival between these groups across minor and major histocompatibility mismatch antigens.38 In another study, Zhai and associates showed that TLR4 stimulation by LPS did not break the anti-CD154 monoclonal antibody-induced tolerance in a murine cardiac transplant model.39 In brief, according to the evidence, TLR4 activation in the acute rejection process is not well-defined. To clarify the direct and indirect association of TLR4 with acute rejection, it is necessary to conduct larger studies and perform meta-analysis of all available data. Despite numerous molecular studies, causes of chronic rejection or chronic allograft nephropathy (CAN), which are characterized by interstitial fibrosis, tubular atrophy, and arteriopathy, have not been clearly understood. Chronic allograft nephropathy is defined as a continuously developing process with various speeds among recipients, induced by a range of predisposing factors such as sustained alloreactivity, immunosuppressive drug toxicity, infections, and repeated acute rejection episodes.40 Prolonged damage of allograft tissue is accompanied by fibroblast activation and fibrin accumulation in interstitium, leading to tissue deformation and loss of function.41 In addition to a proinflammatory environment in the allograft due to alloimmune response, TLR4 can be involved in CAN in other ways. Similar to ischemia-reperfusion injury, which is mediated by DAMP release, obstructive vasculopathies due to chronic rejection could also activate TLR4 through sustained ischemia, resulting in the same injuries. The implication of TLR4 in chronic tissue damage and progressive fibrosis has also been studied in other solid-organ transplant patients. Methe and colleagues compared CD14-positive monocyte levels in patients with chronic cardiac rejection with those of stable recipients and found significant expression of TLR4 in circulating monocytes of patients with rejection. These cells were shown to produce more IL-12 and TNF-α cytokines. They also reported similar findings in a mouse cardiac transplant model, with mice with rejection exhibiting elevated TLR4 mRNA levels.44 Palmer and associates detected increased levels of hyaluronan as an intrinsic ligand of TLR4 in lung transplant chronic rejection tissue (BOS syndrome).45 Despite limited numbers of studies, almost all suggested an association between TLR4 and chronic allograft damage. Activation of TLR4 during ischemia could be due to vascular thickening and occlusion followed by DAMP release, resulting in a sustained subclinical inflammatory process and fibrin formation, which induce a defective cycle of ischemic fibrosis. Although these variations make organ recipients more susceptible to infectious disease, especially opportunist species like CMV, they could be beneficial in the context of graft survival because hyporeactive TLR4 do not respond properly to DAMPs. Many studies were conducted to find whether significant correlations existed between TLR4 polymorphisms and allograft outcomes. Although most polymorphism studies are in favor of the detrimental role of TLR4 activation after transplant, no consensus has been shown about the beneficial effects of Asp299Gly/Thr399Ile mutations in recipients or donors. Interpretations of recipient and donor-based studies are not clear because some trigger stimulators, like hypoxia, activate TLR4 within a donor’s allograft tissue, whereas the recipient’s TLR4 contributes to the rejection process due to alloimmune responses in peripheral blood monocytes and the infectious stimulators that involve both donors and recipients. Determining the implications of innate immunity in allograft damage can be helpful in creating new methods to prevent rejection and promote graft survival, with TLRs as initiator factors in inflam­mation playing a considerable role. Studies on the function of TLR4 during various periods of transplant have suggested that TLR4 plays a considerable role in ischemic allograft injuries at both early and late phases. However, not enough evidence is available regarding its involvement in acute rejection. Non- and low-functional polymorphisms of TLR4 may have a protective role in transplant. Kaisho T, Akira S. Toll-like receptor function and signaling. J Allergy Clin Immunol. 2006;117(5):979-987; quiz 988. Leventhal JS, Schroppel B. Toll-like receptors in transplantation: sensing and reacting to injury. Kidney Int. 2012;81(9):826-832. Kobe B, Kajava AV. The leucine-rich repeat as a protein recognition motif. Curr Opin Struct Biol. 2001;11(6):725-732. Kim HM, Park BS, Kim JI, et al. Crystal structure of the TLR4-MD-2 complex with bound endotoxin antagonist Eritoran. Cell. 2007;130(5):906-917. Lombardo E. Toll-like receptor signaling: Involvement in graft transplantation. Immunologia. 2008;27(2):69-77. Molteni M, Gemma S, Rossetti C. The Role of Toll-Like Receptor 4 in Infectious and Noninfectious Inflammation. Mediators Inflamm. 2016;2016:6978936. Fang H, Wu Y, Huang X, et al. Toll-like receptor 4 (TLR4) is essential for Hsp70-like protein 1 (HSP70L1) to activate dendritic cells and induce Th1 response. J Biol Chem. 2011;286(35):30393-30400. 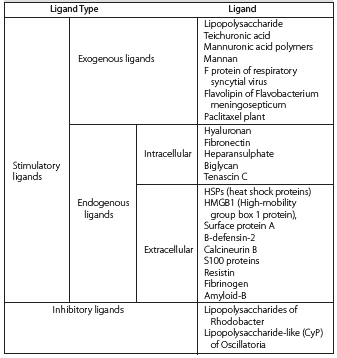 Yu L, Wang L, Chen S. Endogenous toll-like receptor ligands and their biological significance. J Cell Mol Med. 2010;14(11):2592-2603. Erlandsson Harris H, Andersson U. Mini-review: The nuclear protein HMGB1 as a proinflammatory mediator. Eur J Immunol. 2004;34(6):1503-1512. Javid B, MacAry PA, Lehner PJ. Structure and function: heat shock proteins and adaptive immunity. J Immunol. 2007;179(4):2035-2040. Kutuzova GD, Albrecht RM, Erickson CM, Qureshi N. Diphosphoryl lipid A from Rhodobacter sphaeroides blocks the binding and internalization of lipopolysaccharide in RAW 264.7 cells. J Immunol. 2001;167(1):482-489. Macagno A, Molteni M, Rinaldi A, et al. A cyanobacterial LPS antagonist prevents endotoxin shock and blocks sustained TLR4 stimulation required for cytokine expression. J Exp Med. 2006;203(6):1481-1492. Kawai T, Akira S. Toll-like receptor downstream signaling. Arthritis Res Ther. 2005;7(1):12-19. Yamamoto M, Sato S, Hemmi H, et al. 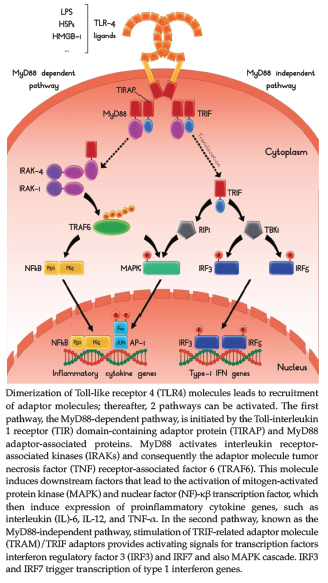 Role of adaptor TRIF in the MyD88-independent toll-like receptor signaling pathway. Science. 2003;301(5633):640-643. Garay-Malpartida HM, Mourao RF, Mantovani M, Santos IA, Sogayar MC, Goldberg AC. Toll-like receptor 4 (TLR4) expression in human and murine pancreatic beta-cells affects cell viability and insulin homeostasis. BMC Immunol. 2011;12:18. Wolfs TG, Buurman WA, van Schadewijk A, et al. In vivo expression of Toll-like receptor 2 and 4 by renal epithelial cells: IFN-gamma and TNF-alpha mediated up-regulation during inflammation. J Immunol. 2002;168(3):1286-1293. Zhao H, Perez JS, Lu K, George AJ, Ma D. Role of Toll-like receptor-4 in renal graft ischemia-reperfusion injury. Am J Physiol Renal Physiol. 2014;306(8):F801-811. Kruger B, Krick S, Dhillon N, et al. Donor Toll-like receptor 4 contributes to ischemia and reperfusion injury following human kidney transplantation. Proc Natl Acad Sci U S A. 2009;106(9):3390-3395. Chen J, John R, Richardson JA, et al. Toll-like receptor 4 regulates early endothelial activation during ischemic acute kidney injury. Kidney Int. 2011;79(3):288-299. Banas MC, Banas B, Hudkins KL, et al. TLR4 links podocytes with the innate immune system to mediate glomerular injury. J Am Soc Nephrol. 2008;19(4):704-713. Braza F, Brouard S, Chadban S, Goldstein DR. Role of TLRs and DAMPs in allograft inflammation and transplant outcomes. Nat Rev Nephrol. 2016;12(5):281-290. Dinavahi R, George A, Tretin A, et al. Antibodies reactive to non-HLA antigens in transplant glomerulopathy. J Am Soc Nephrol. 2011;22(6):1168-1178. Shen XD, Ke B, Zhai Y, et al. Absence of toll-like receptor 4 (TLR4) signaling in the donor organ reduces ischemia and reperfusion injury in a murine liver transplantation model. Liver Transpl. 2007;13(10):1435-1443. Oyama J, Blais C, Jr., Liu X, et al. Reduced myocardial ischemia-reperfusion injury in toll-like receptor 4-deficient mice. Circulation. 2004;109(6):784-789. Zhai Y, Shen XD, O'Connell R, et al. Cutting edge: TLR4 activation mediates liver ischemia/reperfusion inflammatory response via IFN regulatory factor 3-dependent MyD88-independent pathway. J Immunol. 2004;173(12):7115-7119. Tsung A, Hoffman RA, Izuishi K, et al. Hepatic ischemia/reperfusion injury involves functional TLR4 signaling in nonparenchymal cells. J Immunol. 2005;175(11):7661-7668. Chong AJ, Shimamoto A, Hampton CR, et al. Toll-like receptor 4 mediates ischemia/reperfusion injury of the heart. J Thorac Cardiovasc Surg. 2004;128(2):170-179. Chen GE, Wu H, Ma J, Chadban SJ, Sharland A. Toll-like receptor 4 engagement contributes to expression of NKG2D ligands by renal tubular epithelial cells. Nephrol Dial Transplant. 2011;26(12):3873-3881. Chang C, Yoshimatsu G, Akinbobuyi B, Lawrence M, Kane R, Naziruddin B. The Role of Toll-Like Receptor 4 in Islet Transplantation and a Novel Method of Protection Using Chemical Surface Modification. Am Transplant Congress. 2017. Pulskens WP, Teske GJ, Butter LM, et al. Toll-like receptor-4 coordinates the innate immune response of the kidney to renal ischemia/reperfusion injury. PLoS One. 2008;3(10):e3596. Wu H, Ma J, Wang P, et al. HMGB1 contributes to kidney ischemia reperfusion injury. J Am Soc Nephrol. 2010;21(11):1878-1890. Zhang J, Xia J, Zhang Y, et al. HMGB1-TLR4 signaling participates in renal ischemia reperfusion injury and could be attenuated by dexamethasone-mediated inhibition of the ERK/NF-kappaB pathway. Am J Transl Res. 2016;8(10):4054-4067. Wu H, Steenstra R, de Boer EC, et al. Preconditioning with recombinant high-mobility group box 1 protein protects the kidney against ischemia-reperfusion injury in mice. Kidney Int. 2014;85(4):824-832. Krams SM, Wang M, Castillo RO, et al. Toll-like receptor 4 contributes to small intestine allograft rejection. Transplantation. 2010;90(12):1272-1277. Goldberg A, Parolini M, Chin BY, et al. Toll-like receptor 4 suppression leads to islet allograft survival. FASEB J. 2007;21(11):2840-2848. Testro AG, Visvanathan K, Skinner N, et al. Acute allograft rejection in human liver transplant recipients is associated with signaling through toll-like receptor 4. J Gastroenterol Hepatol. 2011;26(1):155-163. Nogueira E, Ponciano VC, Naka EL, et al. Toll-like receptors-related genes in kidney transplant patients with chronic allograft nephropathy and acute rejection. Int Immunopharmacol. 2009;9(6):673-676. Samstein B, Johnson GB, Platt JL. Toll-like receptor-4 and allograft responses. Transplantation. 2004;77(3):475-477. Zhai Y, Meng L, Gao F, Wang Y, Busuttil RW, Kupiec-Weglinski JW. CD4+ T regulatory cell induction and function in transplant recipients after CD154 blockade is TLR4 independent. J Immunol. 2006;176(10):5988-5994. Fletcher JT, Nankivell BJ, Alexander SI. Chronic allograft nephropathy. Pediatr Nephrol. 2009;24(8):1465-1471. Meran S, Steadman R. Fibroblasts and myofibroblasts in renal fibrosis. Int J Exp Pathol. 2011;92(3):158-167. Braudeau C, Ashton-Chess J, Giral M, et al. Contrasted blood and intragraft toll-like receptor 4 mRNA profiles in operational tolerance versus chronic rejection in kidney transplant recipients. Transplantation. 2008;86(1):130-136. Wang S, Schmaderer C, Kiss E, et al. Recipient Toll-like receptors contribute to chronic graft dysfunction by both MyD88- and TRIF-dependent signaling. Dis Model Mech. 2010;3(1-2):92-103. Methe H, Zimmer E, Grimm C, Nabauer M, Koglin J. Evidence for a role of toll-like receptor 4 in development of chronic allograft rejection after cardiac transplantation. Transplantation. 2004;78(9):1324-1331. Palmer SM, Burch LH, Davis RD, et al. The role of innate immunity in acute allograft rejection after lung transplantation. Am J Respir Crit Care Med. 2003;168(6):628-632. Noreen M, Shah MA, Mall SM, et al. TLR4 polymorphisms and disease susceptibility. Inflamm Res. 2012;61(3):177-188. Arbour NC, Lorenz E, Schutte BC, et al. TLR4 mutations are associated with endotoxin hyporesponsiveness in humans. Nat Genet. 2000;25(2):187-191. Ducloux D, Deschamps M, Yannaraki M, et al. Relevance of Toll-like receptor-4 polymorphisms in renal transplantation. Kidney Int. 2005;67(6):2454-2461. Dhillon N, Walsh L, Kruger B, et al. A single nucleotide polymorphism of Toll-like receptor 4 identifies the risk of developing graft failure after liver transplantation. J Hepatol. 2010;53(1):67-72. Palmer SM, Burch LH, Mir S, et al. Donor polymorphisms in Toll-like receptor-4 influence the development of rejection after renal transplantation. Clin Transplant. 2006;20(1):30-36. Souza AC, Tsuji T, Baranova IN, et al. TLR4 mutant mice are protected from renal fibrosis and chronic kidney disease progression. Physiol Rep. 2015;3(9). Kwan TK, Chadban SJ, Wu H. Toll-like receptor 4 deficiency improves short-term renal function but not long-term graft survival in a fully MHC-mismatched murine model of renal allograft transplantation. Transplantation. 2016;100(6):1219-1227. Mutlubas F, Mir S, Berdeli A, Ozkayin N, Sozeri B. Association between Toll-like receptors 4 and 2 gene polymorphisms with chronic allograft nephropathy in Turkish children. Transplant Proc. 2009;41(5):1589-1593. Hwang YH, Ro H, Choi I, et al. Impact of polymorphisms of TLR4/CD14 and TLR3 on acute rejection in kidney transplantation. Transplantation. 2009;88(5):699-705. Nogueira E, Ozaki KS, Macusso GD, Quarim RF, Camara NO, Pacheco-Silva A. Incidence of donor and recipient toll-like receptor-4 polymorphisms in kidney transplantation. Transplant Proc. 2007;39(2):412-414. Nogueira E, Salomao R, Brunialti MK, et al. Expression of TLR-4 and -2 in peripheral mononuclear cells in renal transplant patients with TLR-4 gene polymorphism. Int Immunopharmacol. 2010;10(12):1481-1485. Krichen H, Gorgi Y, Dhaouadi T, et al. Toll-like receptor 4 and CD14 gene polymorphisms in Tunisian kidney transplantation. Transplant Proc. 2013;45(10):3472-3477. Abdolvahabi R, Sarrafnejad A, Nafar M, et al. Association Between TLR2, TLR4, and CD14 Gene Polymorphisms and Acute Rejection in Kidney Transplant. Exp Clin Transplant. 2018;16(1):31-37. Fekete A, Viklicky O, Hubacek JA, et al. Association between heat shock protein 70s and toll-like receptor polymorphisms with long-term renal allograft survival. Transpl Int. 2006;19(3):190-196.